I wanted something very simple for dinner today and Hugh Fearnley Whittingstall’s new book ‘River Cottage – Light & Easy’ had just what I needed. Most of the recipes I’ve shortlisted from this book look easy. Barely cooking at all – more throw some stuff together. Just what you want when it’s freezing cold outside and you’ve just spent an hour heating up a very cold boat! 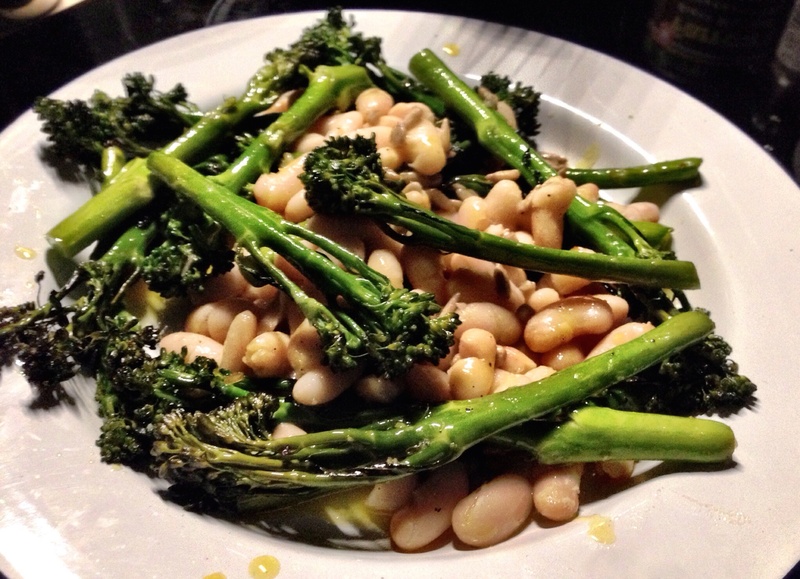 I couldn’t get hold of Purple Sprouting Broccoli so I used tenderstem broccoli instead. This is so easy. Just preheat an oven, roast some broccoli with a little oil and seasoning for 10 minutes, add white beans and sunflower seeds and cook for another 2 minutes. While that’s doing make a dressing of a little garlic, cider vinegar, english mustard, oil and a little sugar. I added an egg yolk to mine – which pretty much makes a hollandaise. Then simply serve the beans and drizzle the dressing on top. This is pretty awesome – very tasty – and was done in less than 15 minutes. Just my sort of dinner. I think this could end up in the ‘go to’ pile. I thought there would be enough for lunch tomorrow – but we had seconds and polished it all off! This entry was posted in 30 minutes or less, Hugh Fearnley Whittingstall, River Cottage Light and Easy, Vegetarian and tagged 30 minutes, broccoli, vegetarian, vegetarianrecipes by tenuoustoaster. Bookmark the permalink.